Meet Lola, a lead character in an iPhone ebook written and designed for children. She now features in a new ebook entitled The Toilet Monster. I'm not a techie myself but even I have to admit that there are pretty neat apps out there (especially after I figure them out). 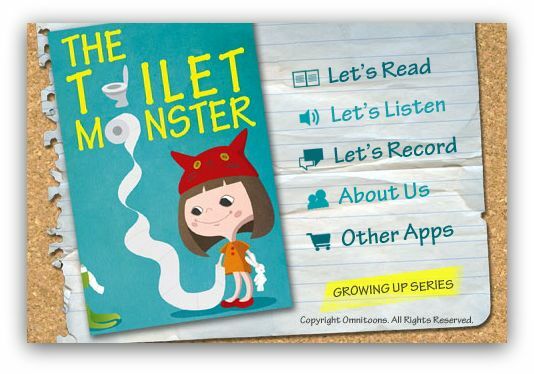 This ebook features a charming short story about a little girl Lola and a monster who resides in her toilet. The monster is a cute one, despite Lola being intially afraid of it. As the story unfolds, there is a twist where the monster is revealed to be timid and afraid of Lola instead. They become friends and for the rest of the story, Lola seeks a new home for it. The illustrations are quite lovely as are the music and sound effects. I really like that there's a feature to record 2 versions of my own voice (or Bubbles' in the future!) reading the book. Its a nice personalisation element which I think may be quite thrilling for young ones. I haven't done that yet as the 'Let's Listen' option works great for us right now. The voice-over is one of a child's. I was surprised at her local accent but decided that it appealed to me as gave a sense of familiarity. Having said that, I believe she was clear and spoke well enough for others who are not familiar with her accent to still fully understand her. So, what was Bubbles' reaction to it? She surprised us by being thoroughly engaged. Even my mother was amazed at how she stopped eating the biscuit in her hand the moment the story started. She giggled at the picture of Lola, and pointed to my phone's screen with her chubby fingers (spreading baby drool all over). When the story ended, she even declared, More! It has been a long time since she has showed such intense interest in any book! I was thrilled with her reaction as I did have some reservations at first about introducing the idea of monsters to her. In general, I have avoided initiating the idea about being afraid, or that things can be scary. So, she has never been introduced to the words 'scared' or 'afraid'. Before she could speak though, I taught her to pat her chest to refer to herself. I realised later that other people see that as a sign for being scared, and I've witnessed on more than one occasion adults telling her not to be 'scared' when she really was just trying to say something about herself. Anyway. From her reaction, I guess my fears were unfounded. The creators must have done their research and designed the characters in a way that appeal to rather than frighten their young readers. Thinking about it, many classics in children's literature also contain mean or evil characters, so perhaps it really is fine to have this little dollop (I couldn't resist using this) of reality. Currently the app requires one to swipe the screen to turn the pages. As Bubbles is not able to properly do that on her own yet, I do it for her, and it becomes very much like storybook reading time, except that I'm not the one doing the reading! Great for some dads I know (not Bubbles') who get thoroughly bored at reading the same books over and over again! haha! The app did stall a few times when I used it, but thankfully there's a function to continue the story from where it last stopped. Like a bookmark. The breaks didn't seem to bother Bubbles at all though. One a side note, I was offered a free download of this ebook but decided that US$1.99 was a negligible sum considering how much kids' things cost these days. I paid for this app myself and am glad I did! this sounds cute! maybe i'll let noey try it out, though i must admit i hardly let him near my iphone :) i really really really don't want him to usurp it! Oops, sorry I meant BRIGHT pink. Not 'bring'.